“Now, here, you see, it takes all the running you can do, to keep in the same place” - The Red Queen, Alice in Wonderland. The Red Queen Hypothesis gives us some food for thought. This evolutionary hypothesis proposes that an organism’s need to constantly adapt, evolve, and proliferate not merely to gain reproductive advantage, but also simply to survive while pitted against ever-evolving opposing organisms in an ever-changing environment. Basically, we’ve got to keep busy to not only survive, but to keep ahead of the competition too. Does our being busy stem from a desire to be happy? The Journal of Happiness shows that Americans work 50% harder than the majority of Europeans and it seems the ‘American Dream’ it what’s to blame. Europeans work to live, so work is viewed as a part of their lives that allows them to do the things they enjoy doing but it’s not the main factor in their lives. Americans on the other hand live to work and are prepared to be busier than everyone else now so that at some point in the future they can be comfortable and hopefully obtain that elusive ‘dream’. Down time, who's got time for that? Our down time has to be busy too, with time keeping fit, entertaining our children, the latest cult TV shows to watch and bestseller books to read. Any time spent simply doing nothing seem wrong and self-indulgent, time ticking away is time that should be packed to the gills with activities and is being wasted. Ironically we’re all searching for ways to be more productive and help us take control of our crazy busy lives. If you Google books on productivity you’re hit with thousands of publications promising to help you get a handle on your busyness. Remember that taking some real downtime can help you build up your resilience to those truly stressful times. 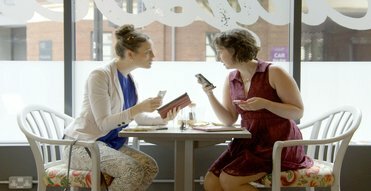 Technology has helped us to be ultra-busy, take a look around you on your commute to work, in the park, or in pubs and restaurants, the vast majority of people around you will be transfixed by their smartphones. They will be checking email, updating their status, tweeting a photo of their drink or food, posting pictures of their kids having a great time. None of them actually taking time to live in the moment. The boundaries between work and pleasure have blurred so much there is no reason not to deal with a work email or respond to a text even if you’re on a day off. It’s hard to truly switch off – I’ve actually deleted my email app from my phone for this very reason, now when I’m not working I’m really not working and I can relax and enjoy time with my family. Give it a try! We’re not truly being productive after 16 hours in the office - or 8 solid hours in front of a laptop without a break working from home like me! - Concentration and productivity will have waned a long time ago. Remember, being too busy can lead to increased stress and this in turn leads to high levels of cortisol which has a negative impact on our long term health. It’s also not good for family life, taking some time off increases productivity and helps us to re-establish our connections with family and friends. It’s time for us to all be a little less busy and take care of ourselves.